Students from Gov. 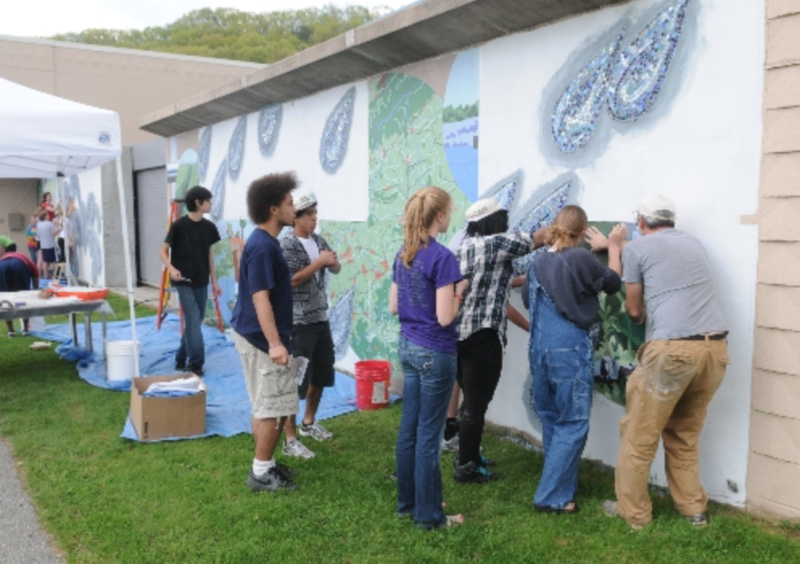 Mifflin and Wyomissing high schools joined in creating and installing a mural on the Western Berks Water Authority’s facility in Lower Heidelberg Township. Water authority members said the mural will serve as the centerpiece of the ongoing renovation project to make the treatment plant more tour-friendly. The mural, showing the cycle of water from rain to the drinking glass, will serve as an educational tool to illustrate the plant’s function. The mural is the first thing children will see as they pull up to the facility. “The entire purpose of this organization is wrapped into it,” authority board Chairman William P. Murray said. The Mifflin and Wyomissing students have been working on the project for months. In the classroom, they assembled the painted scenes and mosaic water drops that make up the mural. For the large water drops, students used bits of hand-cut glass. Last week, on Wednesday and Friday, they installed the pieces on the side of the building. In planning the mural, water authority officials contacted the two school districts to see if students would be interested in helping out. “They wanted it to be a collaboration between our two schools, because the water authority serves Wyomissing, West Reading and Shillington,” art teacher Michael Miller said. Miller teaches at Wyomissing and helped organize the project. Miller’s public art class oversaw the project and did much of the big-picture planning. Gov. Mifflin art teacher Chris Allen’s students came in with the fine details. “The kids had a great time,” Allen said.